fish | Random moosages as I see fit. I was recently informed that certain trees smell like fish when they are in bloom. Unfortunately, I never wrote down what tree is supposed to smell like fish and I’m too lazy to ask again. My imagination provided me with ample information. Actually, I imagined this even before the person told me what kind of tree they were smelling. And then they told me what the tree was and I was disappointed. Or at least, I remember being disappointed when I was told what the tree was. I also remember thinking that the tree doesn’t smell like fish at all. Too bad I can’t remember what the tree actually was. Anyway, the tree my imagination was much better. So behold! I present you the weeping willow dead tree fish! I just figure that the tree smells like dead fish. Live fish don’t normally smell like anything. (Never buy a fish from the market if it smells fishy; it’s gone bad.) The blossoms must look like dead fish. Actually, I think it’s the fruit that looks like dead fish. It must be a stinky tree. The tree is probably sad that it has to stink. So it weeps. The only trees that weep are weeping willows. 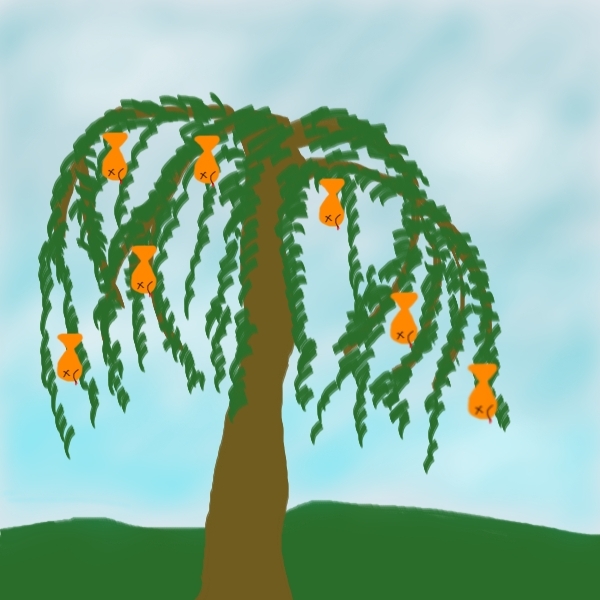 So there you go, a weeping willow dead fish tree. Tada! Last week, I had the dubious pleasure of picking up my friend, the time traveler extraordinaire, from the airport. I say dubious, because…she’s not a very good time traveler. I thought maybe this would create a bit of a problem this time. Actually, it didn’t. Her flight was slightly delayed, but that wasn’t really her fault. Time traveling was a non-issue this time around. That was nice. What did end up being a problem (aside from the fact that everyone wanted to be at SNA that night thus making it really difficult to post a good lap time) was the fact that her keys had magically disappeared. Magically. She told me so beforehand, actually, but I figured it was just one of those things where you put your keys away in your bag and since you don’t need them and don’t see them for the duration of your trip, and so you feel disconcerted when it comes time to fish them out when you get home. I figured her keys were just some place in her bag and it would just take some rooting around to find them. Yeah. That wasn’t the case. When we arrived at her place of residence, I decided that it probably be a good idea if I stayed until she found her keys. Because, you know, I could have just left her to sit on the front steps of the house, mewing piteously. So she went to work, rooting around her bags to see if she could find her keys. She mentioned that her car keys were on the same keychain as her house key. She also mentioned that she may have left her keys out in the hinterlands where she had been traveling. Aha! Instead of blindly digging around the luggage in search of keys that may not even be there, why not just lug everything out by her car and see if it unlocks? You see, she drives one of those newfangled cars that unlocks itself when it senses the transponder in the key. So, if the car unlocks, we can continue looking for the keys. If it doesn’t…well, we’ll have to do something else since the keys obviously aren’t in her bags. Turns out, her keys weren’t in any of her bags. We did ridiculous things like hoist her suitcase up above her car, just in case the keys were in the very bottom. So, we resorted to doing something else, i.e. breaking into the house. Did you know, I have never broken into someone else’s house before? It’s true. And here I was looking all suspicious with my flashlight as I was sneaking around the house, looking for the best place to get into the house. Ok, so I wasn’t actually sneaking. If her neighbors were looking, I’m sure they would have called the police right away if they saw me sneaking. I just walked around normally, but quietly, with a flashlight. People do that all the time around their own houses late at night, right? Anyway, we did finally get in. Our method for breaking and entering involved a flash light, a saw I randomly found on a lawn chair, a pool skimmer, and a discussion on whether or not the koi would be of any help (they wouldn’t, and probably would be confused). You can guess what exactly we did. We didn’t permanently damage anything, in case you’re wondering. Also, we did not do this. Oh, and her keys were in the house the whole time.